According to the American Academy of Sleep Medicine, 10 percent of adults in the United States have a chronic insomnia disorder. That translates to roughly 32 million people in the United States alone who struggle to fall asleep or stay asleep at least three times per week for at least three months. Sufficient sleep boosts energy levels and makes it easier to focus and concentrate, while insomnia contributes to poor memory, disturbs mood and leads to daytime sleepiness. But insomnia is not just harmful to individuals. The AASM notes that researchers estimate that insomnia costs an estimated $63 billion in lost work performance each year in the U.S. Combating insomnia is no small task, but the following healthy sleep habits may help men and women overcome their bouts of insomnia and get more restful sleep. Avoid too many beverages before bedtime. Drinking water or beverages that include caffeine or alcohol too close to bedtime can interrupt sleep or make it difficult to fall asleep. Too much water before going to bed may lead to nightly bathroom breaks that interrupt your sleep. Along those same lines, alcohol consumed too close to bedtime may make it easy to fall asleep fast, but you’re likely to wake up once the effects of the alcohol wear off, which can be very soon after your head hits the pillow. In addition, avoid caffeinated beverages in the late afternoon or evening, as caffeine stimulates the central nervous system and may compromise your ability to fall asleep. Nicotine also serves as a stimulant, so smokers fighting insomnia should avoid tobacco products in the hours before they plan to go to bed. Get out of bed if you can’t fall asleep. The AASM recommends getting out of bed if you haven’t fallen asleep within 20 minutes of lying down. The longer you lay in bed without falling asleep, the more likely you are to dwell on your sleeping problems. If you need to get out of bed, spend some quiet time reading a book in another room before returning to bed. Dim the lights inside your home. Two to three hours before bedtime, dim the lights in your home. Dim lighting signals to your brain that it should begin making melatonin, a hormone that is closely associated with sleep. Eliminate potentially distracting sounds. A poor sleep environment can contribute to insomnia, and distracting sounds can make it hard to fall asleep. Fix distractions such as leaky faucets and close bedroom windows if nearby traffic is compromising your ability to fall asleep at night. The higher the altitude, the greater the sleep disruptions. Exercising regularly makes it easier to fall asleep and contributes to sounder sleep. In general, most healthy adults need seven to nine hours of sleep a night. Sleep is just as impor tant as diet and exercise. Snoring is the primary cause of sleep disruption for approx. 90 million American adults. Healthy living is within reach with wellness wyoming! This family-friendly guide will publish quarterly in the Wyoming Tribune Eagle, Laramie Boomerang, Rawlins Daily Times and Rock Springs Rocket Miner. 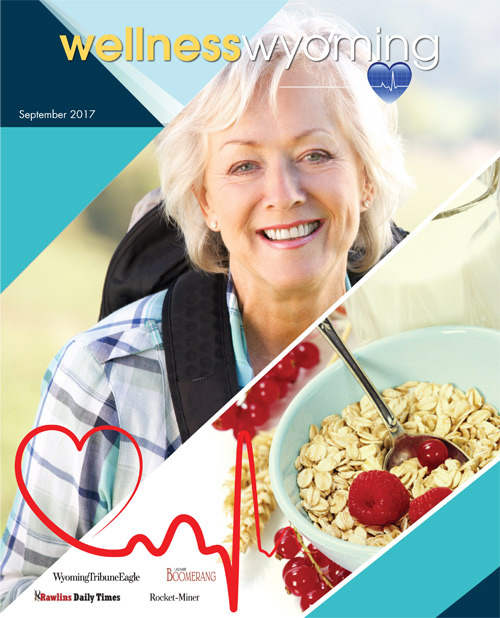 Healthy living is a long term commitment, and this guide will provide readers what they need to know to eat right, stay healthy, manage stress and a whole lot more. Don’t miss this opportunity to showcase your business to over 27,000 Wyoming households!